This is obtained either by tempering a martensite steel at between 250 and 450°C or by quenching steel at a speed insufficient to suppress the thermal change point fully. 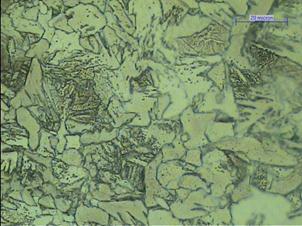 In comparison to martensite, this is less hard and brittle and also weaker than martensite. At the transformation temperature, the inter lamellar spacing decreases to 1X10-7 -- 2X10-7 m. It has dark appearance on etching.